Hey! I’m back after a long break, but you know what it’s like! life gets in the way… So, soon to be the holidays, although it doesn’t really feels like it with that weather. So I thought I’d come back with a triangle tutorial. 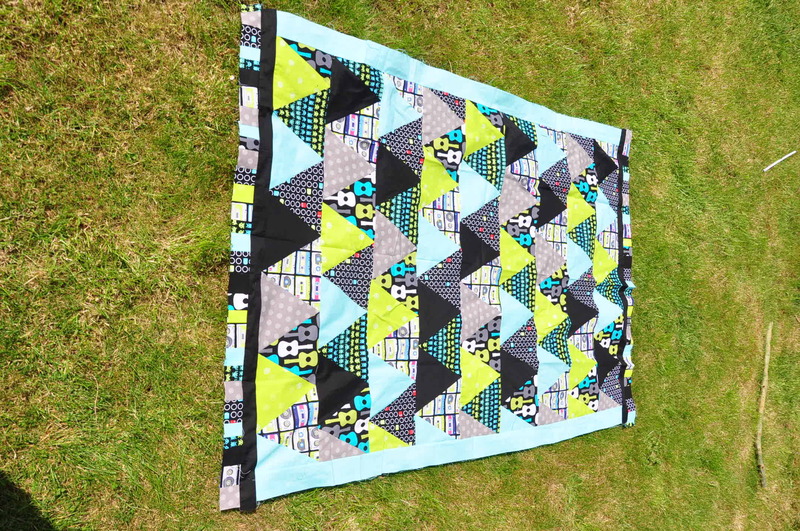 My eldest chose a long time ago some really cool fabrics and wanted another quilt (greedy) (really I know how he feels!). 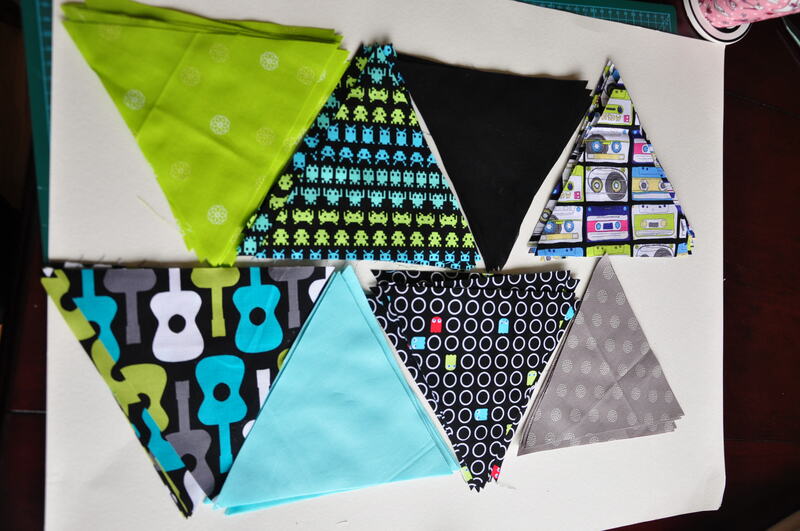 8 fat quarters, a triangle template, back fabric, wadding and the usual sewing paraphernalia. Then place them on your floor in the position you want, I tried to have some patterned fabrics mixed with plain fabrics to relax the eyes a bit, usually I like a lot of white in my quilts so it’s all new to me! 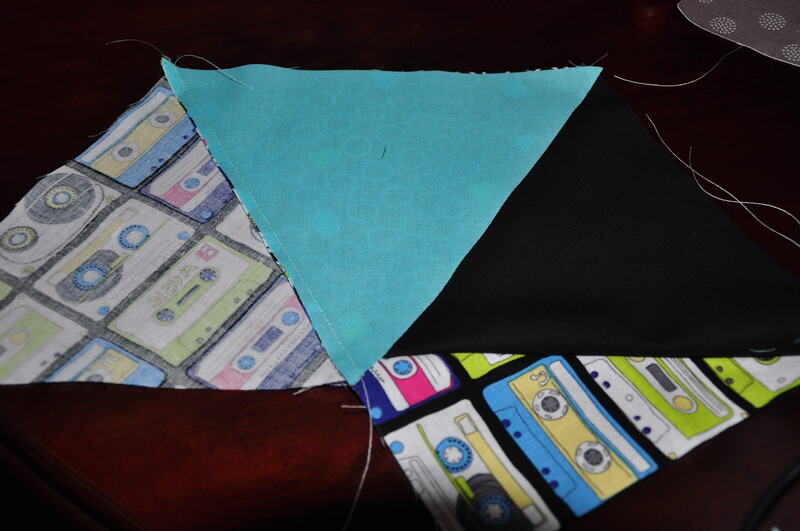 Hhere I have two triangles sewn together: the half cassette one to the black one, I now add the turquoise triangle to the pac- man fabric. it makes a line. Press with an iron all the seams to one side. so there you go nice and easy! it takes a bit of time but my son loves it! all you need to do (well What I need to do really!) is quilt it and bind it! et voila! any comments and questions please don’t hesitate!! You have such vivid patterns! My readers at FaveQuilts.com would love them. I love your quilts and your tutorials are great!! 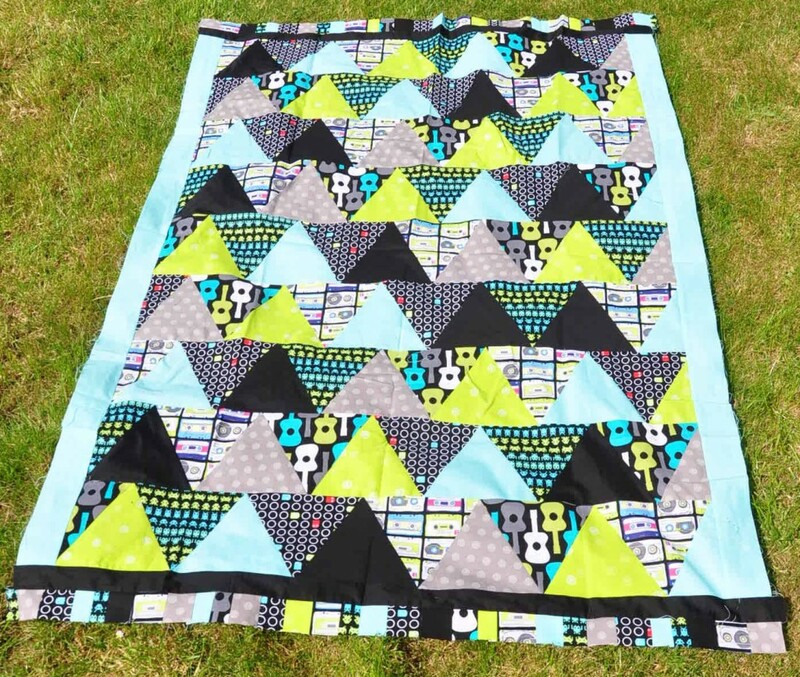 One question about this quilt,What size triangle did you use for this quilt? It’s about 8″ on two sides and 7″ 7/8th on one side. but I didn’t really decide on a specific size I decided I’d quite like that and went for it! you can make them bigger (so it’s quicker) or smaller! Sorry It’s not very precise but I throw the triangle pattern away. Happy sewing Melody! 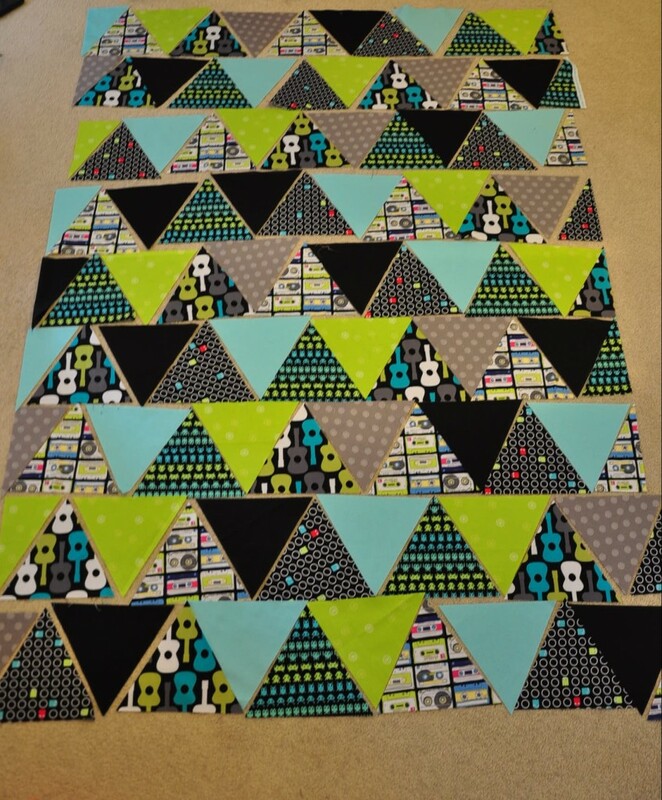 Do you have any hints on sewing triangles together? I’ve tried several times but they never seem to turn out even. Always start your stars from the narrowest point and a bit of material to make sure your bang on 1/4 ” and you will find it goes together real easy! Good luck and hope to see a photo of your challenge! Thanks Tina for helping! great advice! Join us again soon! 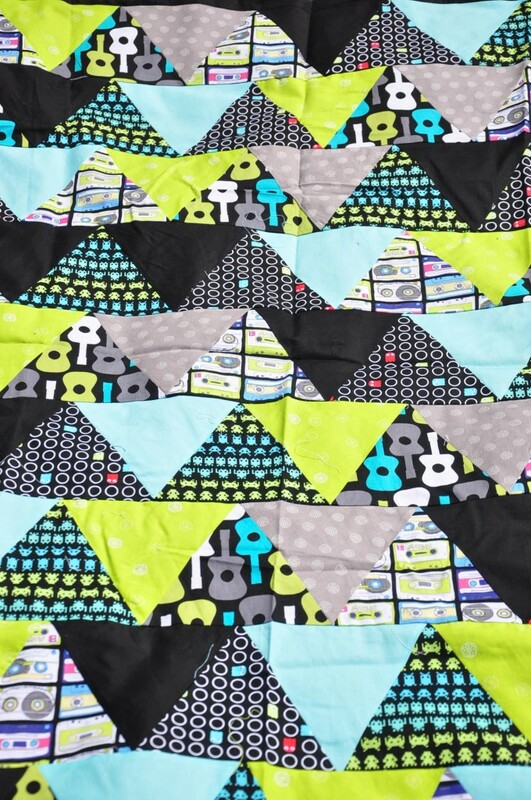 Love this quilt, am putting it on my list of projects to do! Thank you for such a wonderful idea! A nice quilt. I specially loved your fabrics selection. it’s great! how big was the finished quilt? 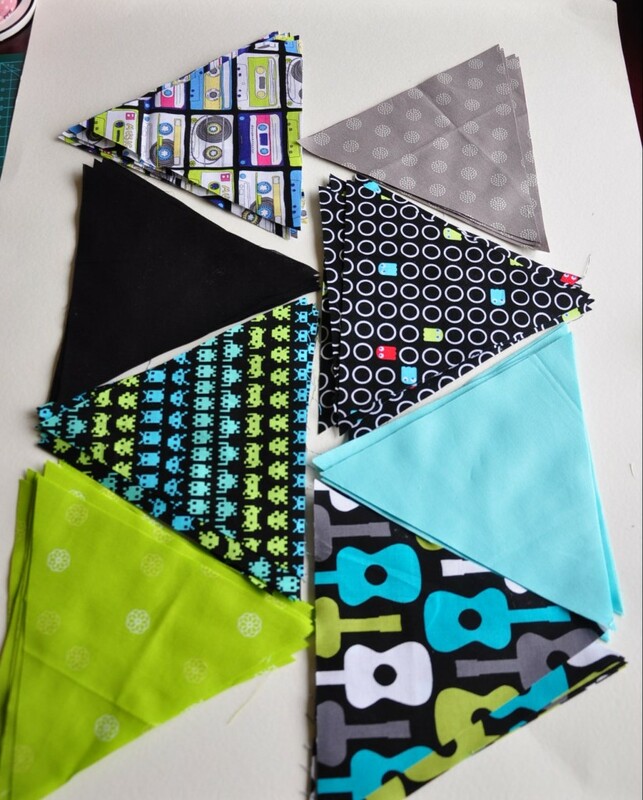 I am very new to this and am looking for easy patterns for a baby quilt. I have actually decided to frame it with a apple green fabric to make it bigger do that it will fit on my son’s bed. I’ll let you know once I’m finished. 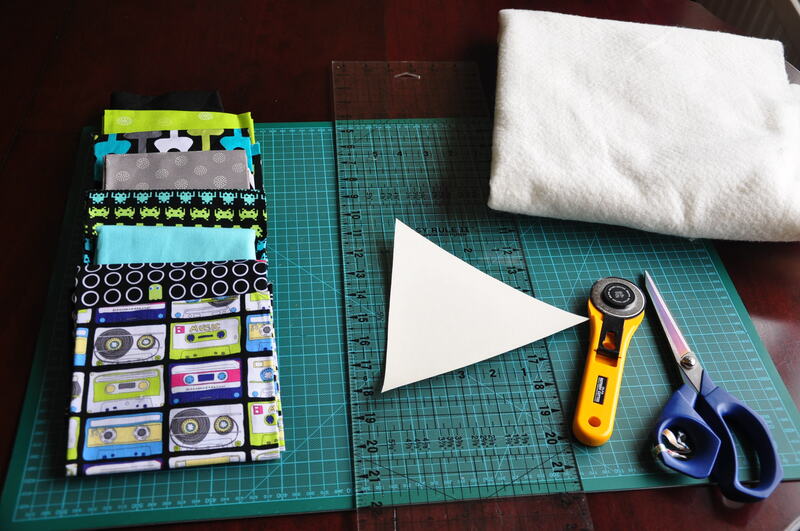 But you can make less triangles for a baby quilt. Happy sewing and send pics of finished project! To be honest, I don’t remember paying attention to the straight grain but I see your point. 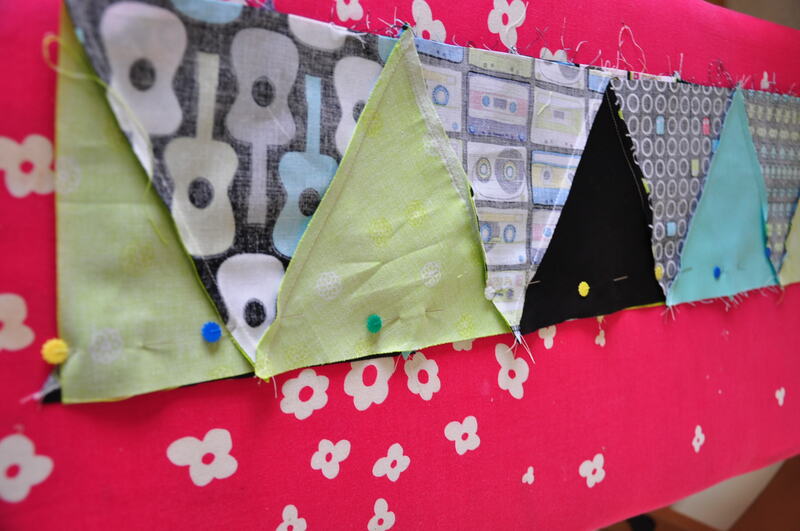 I usually go for what will give me more of my fat quarter (I’m a bit tight with fabric) but then when i sew together or press with iron I try and make sure I don’t pull the fabric. Sorry it’s probably not useful at all…I hope you are happy with your quilt! Great advice, thank you Mary!! Yes, thank you Mary! I did say at the beginning that one can make this project with a special ruler but I did not have one. so make and do! thank you, for your great and informative comment! Hope you come again soon! I noticed you used a piece of paper for your template. I always use “old” X-ray material (old x-rays) they work great and you can use your rotary cutter with them. I save the ones I have made and re-use them on other projects. Makes the cutting process much easier. Beautiful quilt btw! Love the easy projects. Thanks for sharing your great tip! Thanks for stopping by! Thanks for sharing the Triangle Pattern. Easy but placing the side cut on the grain always confuses me. Please help. Fabric rarely comes off the bolt with the fold on the straight of grain. To square, pull a thread all the way across or cotton can be torn to get a straight end to start the cutting. If there are any ‘fuzzy’ threads after tearing, you can make a clean up cut to eliminate them. Straight of grain is usually the way the selvedge goes, the length of the fabric. Also can be the cross grain, from side to side. Pretty hard to put the two angled sides of a triangle both on the straight of grain. :-) I would put the bottom wide side on the straight. Alternate the ruler every other cut so there is not waste. Most any way you cut it, at least 2 sides are going to be on a bias grain to some extent. Starch the heck out of your fabric so it is more like a piece of paper. (think about sewing two pieces of paper (your starched fabric) together or 2 floppy lasagne noodles (your unstarched fabric) together. Much easier to sew starched fabric. Starch lightly, press and repeat two or 3 times to achieve the ‘paper’ feel of the fabric. DO NOT stretch fabric as you press the starched fabric. Then cut carefully with a rotary cutter. The heavy starching will help control those biases. Don’t stretch as you sew or press. 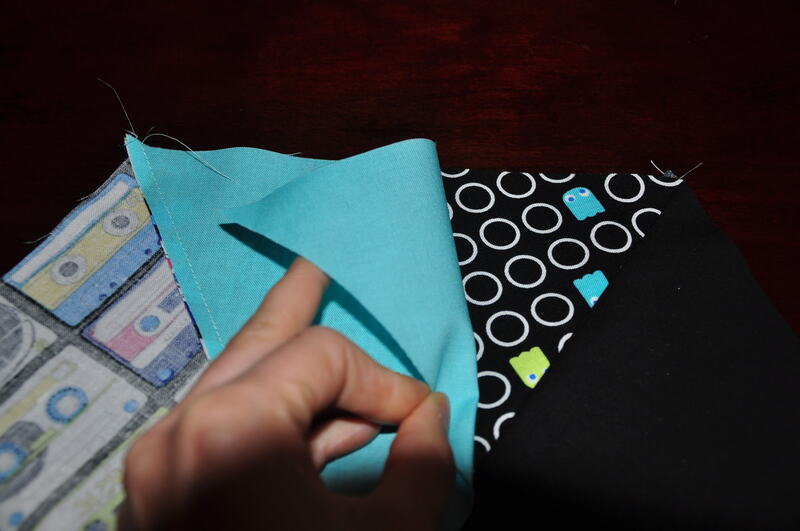 When sewing them together, leave a quarter inch hangover at top and bottom to allow for the quarter inch seam allowance to line up when you press. 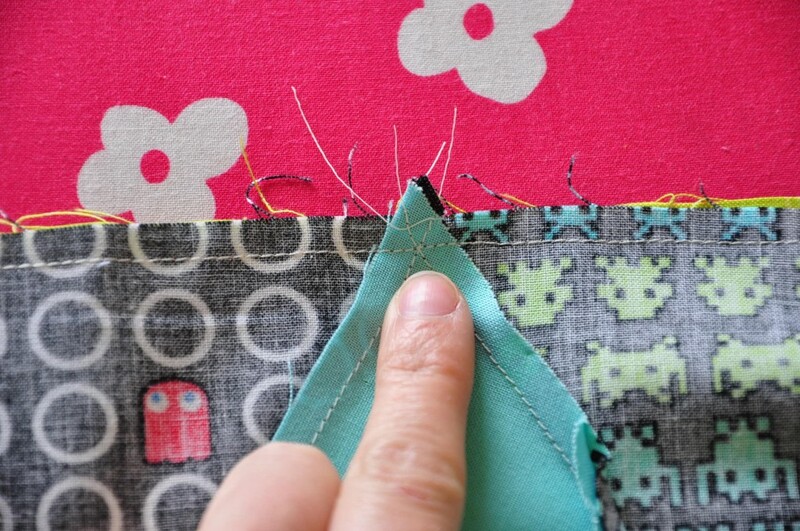 A triangle trimmer is a help to allow you to cut those points properly so they will line up automatically. There are different ones around but I know Fons and Porter have one. When finished you can wash the quilted and bound quilt to get rid of the starch if you want to. I haven’t! sorry for the late reply! 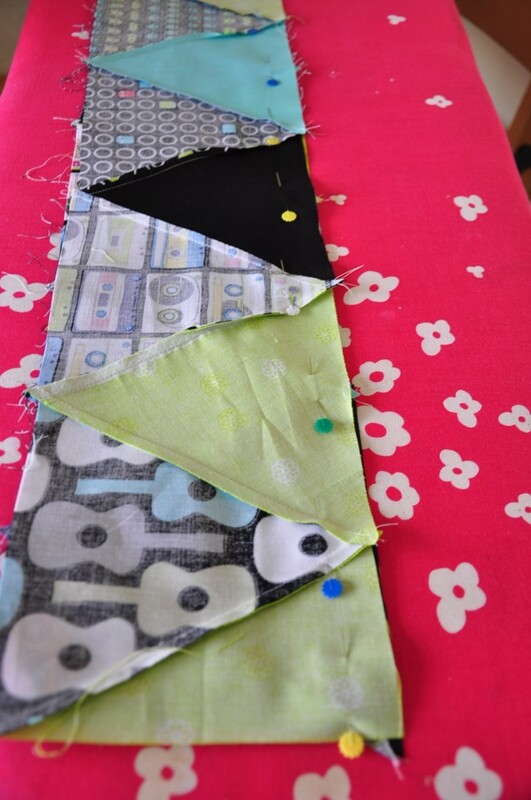 I still have not got round to quilting it but I’m thinking of machine quilting straight lines half an inch apart. hope this help! happy sewing! Thanks a bunch for sharing! I am between projects now and thus would be just right to make it NOW! I’ve been looking for an easy pattern for the quilts I make for children who have a parent in prison. 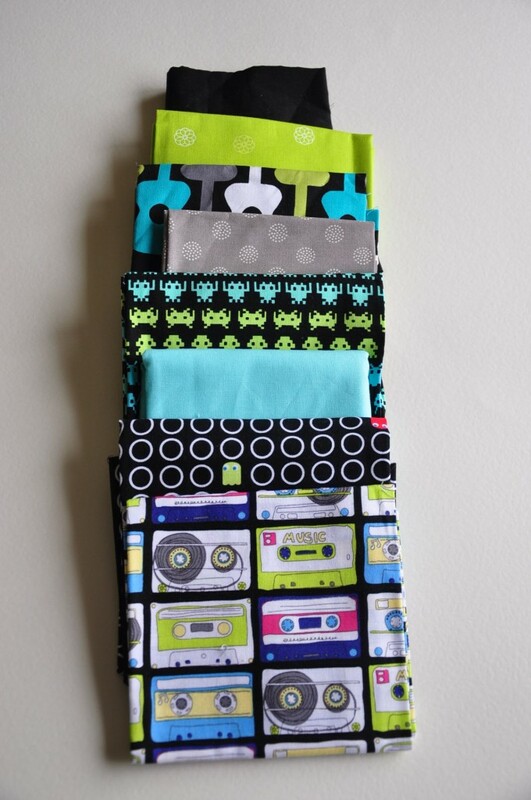 This pattern will be great for the boy quilts. I love this quilt! This is a great mix of colors, very nice. Thank you for posting, I am ready to make one. I love this quilt. I have never tackled triangles, but I will now. I make quilts for kids in hospital and love the fabric you used. It would be great for a boy’s quilt and the hospitals are in need of quilts for boys and teens. 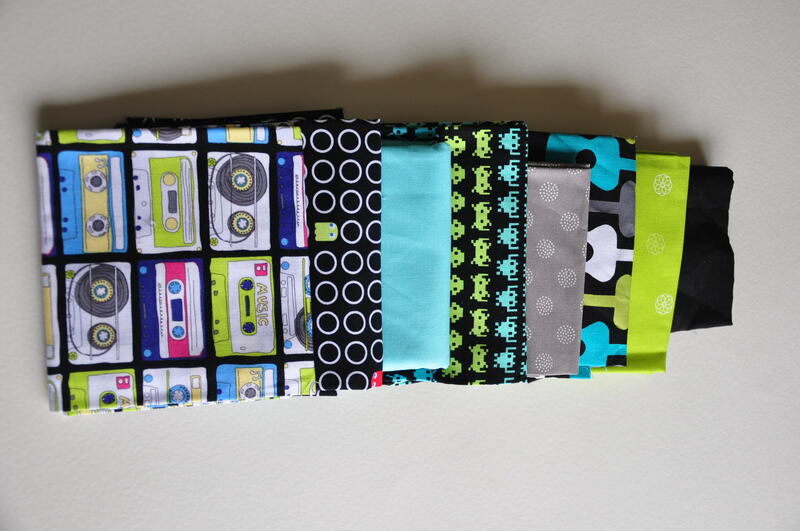 I really would appreciate if you could let me know where yougot your fabric and the name of the bundle if possible. Really lovely to hear you are making quilt for charity! I’m afraid those fabrics are from different places and from different designers. But it was a few years back now that I bought them and I cannot remember the names of the fabrics. I think a few of them are from Robert kaufman. I’m sorry I cannot help more. don’t hesitate to tell me and show us which fabrics you decided to use! Happy sewing! How wonderful that you are involved in making quilts for hospice as well as baby quilts. Your group has done an outstanding job! It always gives me such a warm feeling when I hear about these kinds of endeavors. Keep up the great work!!! I’m a quilter in a guild in Cape Coral, Florida. We will soon have a Quilt Blessing when our charity quilts will be donated to several hospitals, etc. How many members are in your group? I’m very impressed with your club donating over 800 quilts. Good for you. Tina, do you use a particular wadding for the premature babies? Someone told me that it needed to be non-allergenic, 100% cotton. Would you agree? great quilt. I tried doing some triangles around the edges of a quilt once and had to take them off in the end. I did come across a tip on another site recently, and I’m sorry I can’t remember which one, but they suggested using spray starch to iron the triangles to help keep them from stretching. Another tip I came across was to use iron on interfacing but I thought this was bit too much. I will have a go at this one when I have amassed some more denim as I think pale blue, denim and white might look good. Thanks for the tutorial, what would we all do with out you wonderful teachers. When using 8 fat quarters, what size is finished quilt? I am a total beginner. 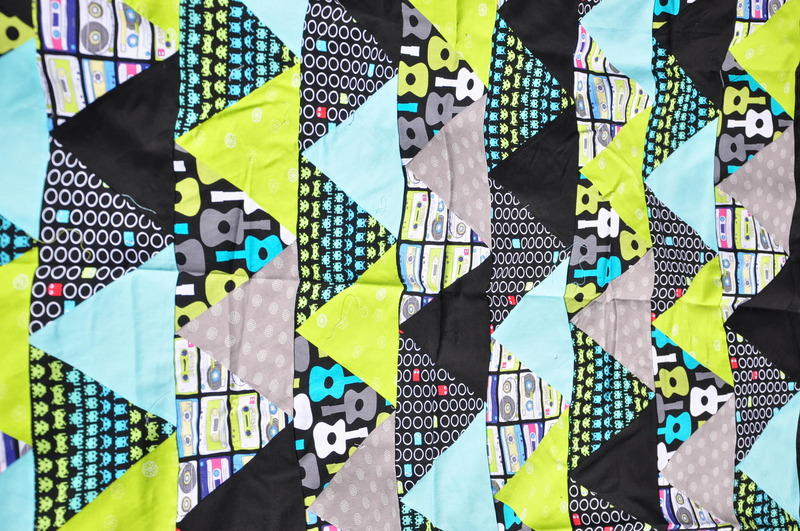 Love that triangle quilt. I am about to finish the front of my first quilt. How do you get an edge to connect back with front? Some people say binding but I have no clue what that means. I suggest a proper triangle template is essential. 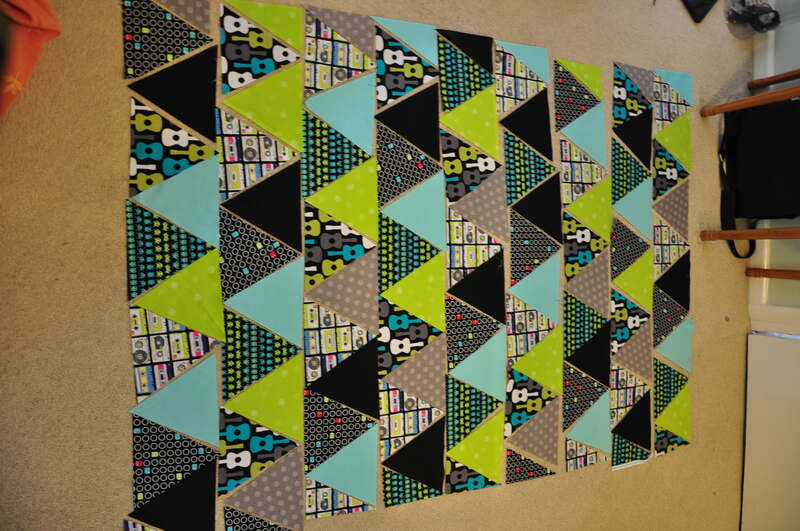 I have made several triangle quilts and so the investment was worthwhile. The template is adjustable, and so you have a choice of sizes. Templastic is much better than paper and ruler, although it is easy to trim slivers of that with rotary cutter, as it is quite thin. There ar lots of possibilities with triangles. I agree with using a proper template but I’m thrifty and if I can make do without, then it is fine by me. It is useful but I wouldn’t say essential, specially if you are going to quilt one triangle quilt. Thanks for stopping by! love it!! just may try it. the geese pattern is different?? I was looking for a design for a new quilt for my granddaughter and this one is perfect. I also made my own cardboard template, didn’t take all that long. Here is a photo of the layout I came up with, as I finally got started on the sewing this week.